When you have found an emotional plateau, you will see the Ace of Cups in your Tarot reading. This card represents the culmination of a sacrifice that has been rewarded with satisfaction, contentment and a deep, lasting peace. This is the Tarot deck’s card of true love and it would be hard to imagine a soulmate Tarot reading without the presence of the Ace of Cups. From out of a cloud appears a hand holding a Cup balanced on its palm. From this gold chalice emanates four plumes of water, which steadily pour down into a lake populated by floral lily pads. A white dove holds a communion wafer in its beak just above the rim of the Cup. The white hand glows and the wispy cloud from which it comes is silver-gray in tone. The Cup is engraved with a “W” in some Tarot Decks, an insignia for Arthur Edward Waite, the father of the modern tarot deck. The Christian ritual of communion is a re-enactment of Christ making the ultimate sacrifice for his followers. When the Ace of Cups appears in a Tarot reading, there is the feeling that a love is so deep that one partner would be willing to die for the other. This is not a harbinger of any such passing, just a metaphor for the depth of the love that is being expressed here. Aces are the culmination of a suit’s meaning and Cups represent emotions. The dove, of course, is a symbol of peace; the peace that such love brings a person and the peace that one is able to thus send out into the universe. 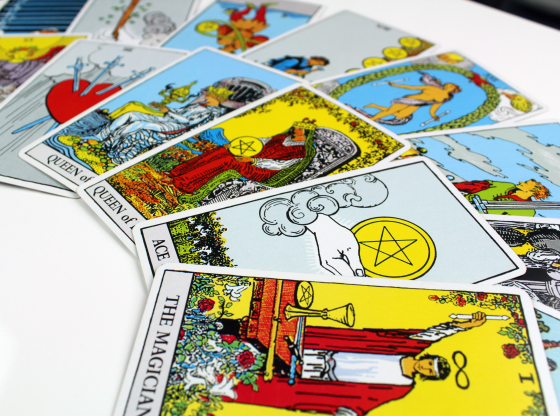 When a Tarot Reading begins, the cards are dealt into areas regarding your past, present and future. Where each card lands is the area of your life story that it will help describe. When the Ace of Cups is in the past position, you have a lover of great importance in your past. Were you dumped and the tale became sad after such a wonderful peak? On a better note, the Ace of Cups here often serves as a foundation to the reading and informs the Tarot reader that you have a sophisticated mastery of your emotions. 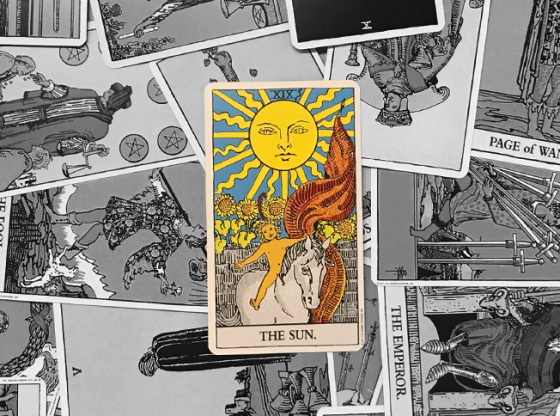 When the Tarot spread reveals the Ace of Cups in the present position, you are probably getting the reading because of a new love interest in your life. Perhaps you have a strong intuition that “the one” is near. A certain lack of anxiety will bring you a sense of happiness when this card arrives in the present position. The Ace of Cups in the future position indicates that you are pursuing love as a goal in this lifetime. This is not necessarily a great position for this Ace as it questions your motivations. Is love something that you pursue in order to justify a lousy current situation? Are you too picky about who you date out of some misguided desire to “have it all” or have a mate who shows that you won some abstract contest to rein in a millionaire stud who worships you? The Ace of Cups in this position confronts you that an idealized notion of love off in the distance is a poor substitute for the real thing. Many Tarot readers prefer to pull any of the Aces off the table and hold them above the reading, an act referred to as exalting the Ace. Aces are considered so powerful that they cannot mix freely with other Tarot cards and therefore serve as a subtitle for your entire reading. 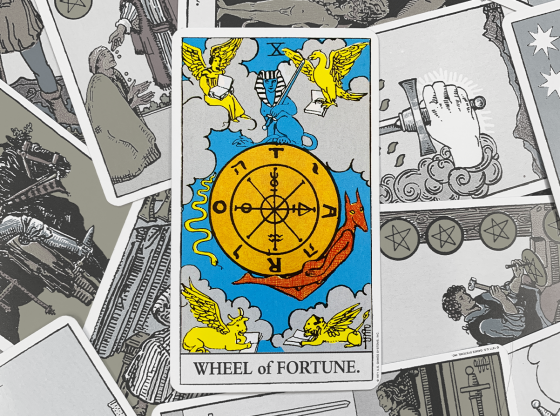 If your Tarot reader follows the tradition of allowing the Ace to hover above the reading, the lessons about love and emotional maturity will be all the deeper and more meaningful for a full understanding of your situation. 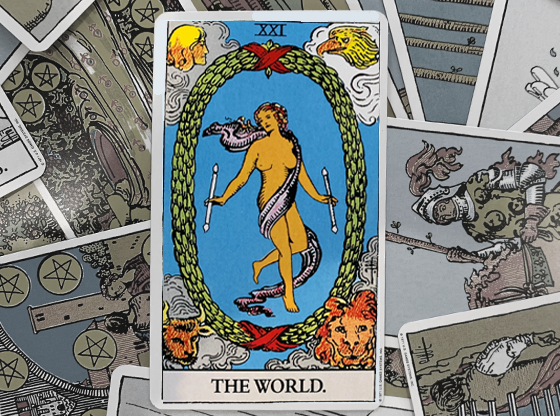 Each Tarot card in a reading informs the interpretations of the other cards. 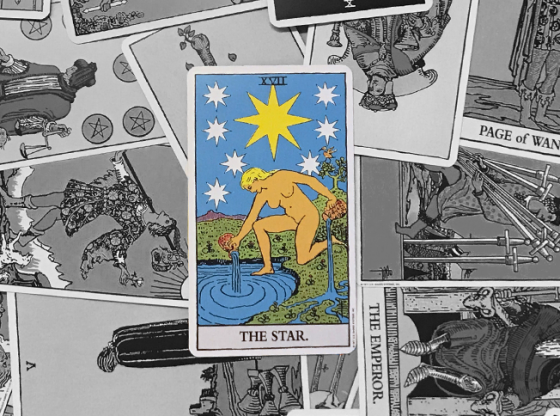 If your Tarot reader leaves the Ace of Cups in the Tarot spread before you, the cards around it gain an influence over the meaning of this special Tarot symbol. When paired with another Ace, the mastery of emotions will be complete and lead to success in a definite avenue of your life. When The Emperor or The Magician are in your reading accompanying this card, look for a position of authority to give you great satisfaction. Power and influence require a stable base from which to judge and the Judgment card near the Ace of Cups indicates you are making great life decisions. 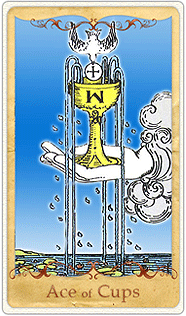 Temperance is a card where the main character seems to be using the Ace of Cups to stay on the stable and sane path. So accept the Tarot’s message of stability when this card appears. 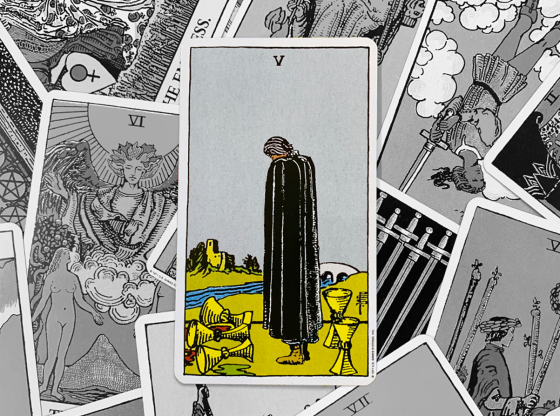 If Death is drawn in a reading that features the Ace of Cups, look for your loneliness to be the thing that is dying. An emotional stability that comes with being accepted by a partner is on its way. When there are lots of other cards from the suit of Cups in a reading with their Ace, the emotional foundation for growth and leadership is truly present. 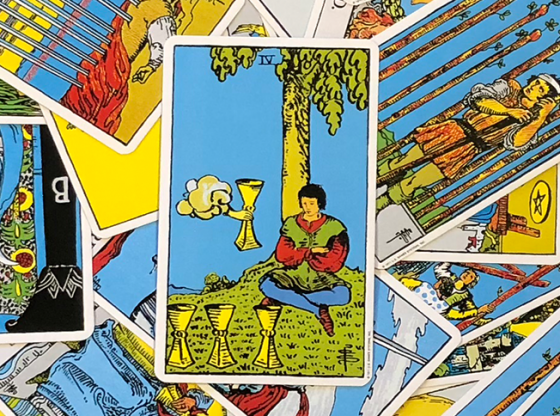 If the reading with this card also has many cards from the suit of Wands, a business idea you have could be just what is needed in your chosen field. A fortune could be bubbling over. 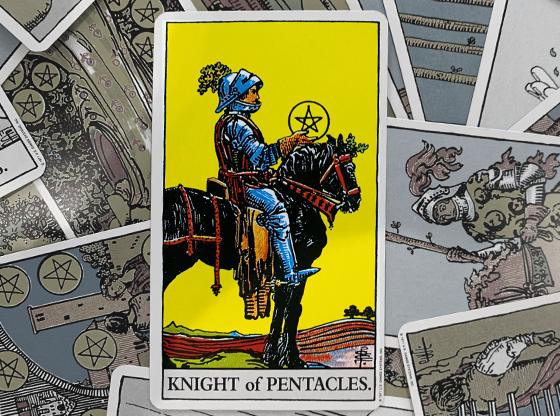 When the Ace of Cups combines with many cards from the suit of Pentacles, you must ask yourself if your love of material possessions is getting in the way of a love of yourself and those around you. 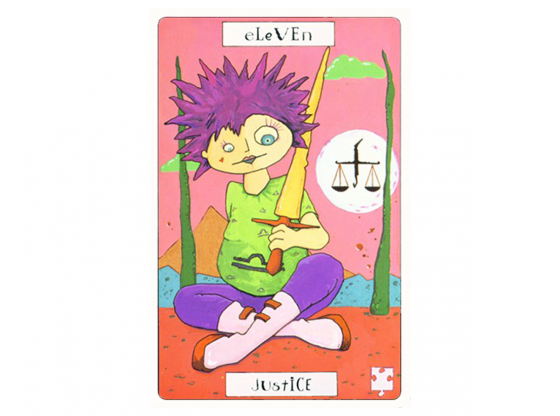 With the suit of Swords combining with this card, you have an opportunity to use verbal communication to get a deeper understanding of your feelings. Have you met a soulmate who actually understands your deepest desires and hopes? When the Ace of Cups is in the same reading as The World, look for some of those deepest hopes and desires to be more than just understood; this card combination is like bulldozing a trail straight to your life’s goals. 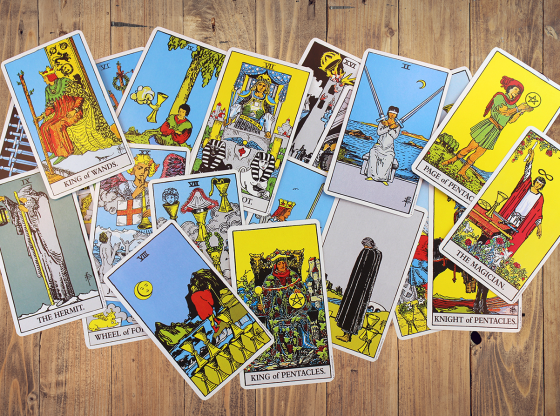 It is one of the magic moments in all of Tarot reading.